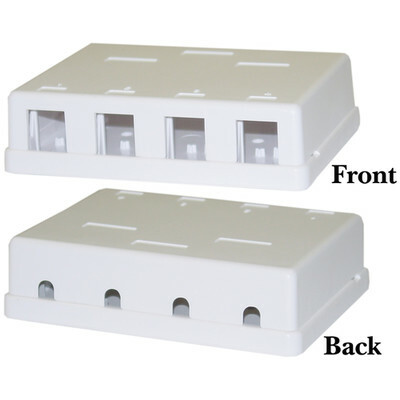 This white surface mount box is designed to house up to 4 keystones of any type. Keystones come in many different varieties, from network jacks to HDMI couplers, BNC couplers and beyond. Networking, Home Theater and security/surveillance is all covered by this simple to install and highly dynamic surface mount box. Now your installation can a professional appearance and structure. Accepted keystone inserts well. Came with both tape and wood screws for mounting. Location to tie wrap each wire to the box for additional support. Ports numbered and also has a location to write or label both the box and each port. Great design.